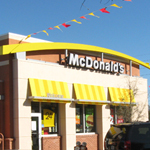 JACKSONVILLE BEACH, Florida (November 10, 2008) – McDonald’s converted this former Jacksonville Beach Boston Market into a stylish and unusual restaurant. Your Bicycling Gourmet rode up for its first day serving breakfast, Friday. The company, like many at the Beaches, remembered to install a bike rack for its customers. Its small, but its there. Nearby fences and trees could be used to secure your bike with a chain or cable. In the photograph, you can see the stylized Golden Arches on the front of the building. The unusual decor continues inside with comforting accents in a lemon-lime color that reminded me of Sprite. Other accents are greys and beiges that are offset with very dark wooden panels as were popular in the 70s. The effect gives a clean look and an appearance more like a restaurant than a fast food joint. There was plenty of smiling, friendly help. The woman who waited on me was thoroughly familiar with the menu, even though the restaurant had been open less than 24-hours. 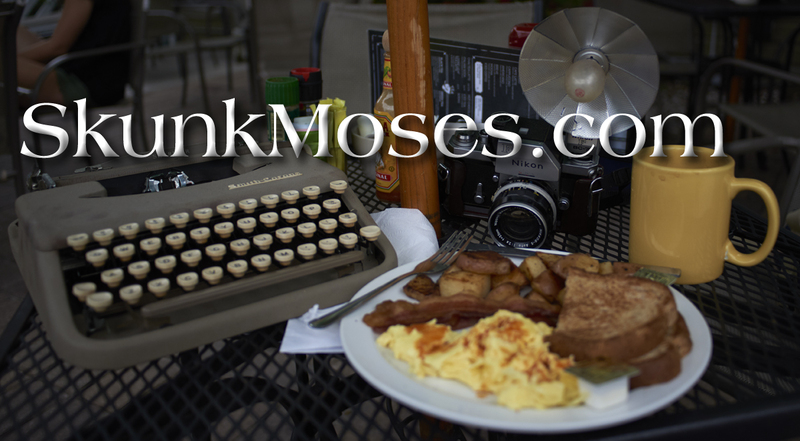 I ordered typical, fast breakfast food – a sausage biscuit and coffee – and ate inside. The sausage was mellow and sure not to offend any pallet. I would have preferred it a bit more robust and peppery. The biscuit itself was soft and chewy and a bit salty. The coffee was far too hot, in my opinion. There were free refills, but my cup took so long to cool to drinkable temperature, I didn’t have time for a refill. The Beaches have seen a number of family-style, moderately priced restaurants close over the years. The previously mentioned Boston Market, a Golden Corral on Beach Boulevard, Shoney’s on Atlantic Boulevarad, numerous sit-down Chinese restaurants, and Ryan’s Steak House on Atlantic among them. This McDonald’s also seems less oriented to families – it has only three booths. The remainder of the ample seating was at counters or at two-seater tables. Overall impressions – its clean and looks more like a restaurant than a typical McDonalds. Food was the same as you’d find at any in the chain – satisfying but hardly alluring. Hey, its McDonald’s.